Every year of the Mayor-a-thon, Mary Ching of Wailua and Kathy Leonard of Kalaheo have been there. They have different roles. Ching has been a walker. Leonard, a volunteer. But they share a love for this free community event that, in its 10th year on a sunny Saturday morning, attracted about 1,000 people. Leonard loves that the event brings out families, young and old, to share a morning dedicated to physical fitness at all levels. “So that really attracted me, and it’s time anybody can talk to the mayor, have his ear for five minutes,” she said. “You see everybody coming together from all sides of the island to do something special,” Leonard added. Leonard, busy with her duties registering and organizing, has never actually joined the crowd when they head out on Ke Ala Hele Makalae, the path along the ocean. About 300 people joined Mayor Bernard Carvalho Jr. in his signature dance and a record attempt at the most people in Hawaii doing the “Electric Slide” at one time. 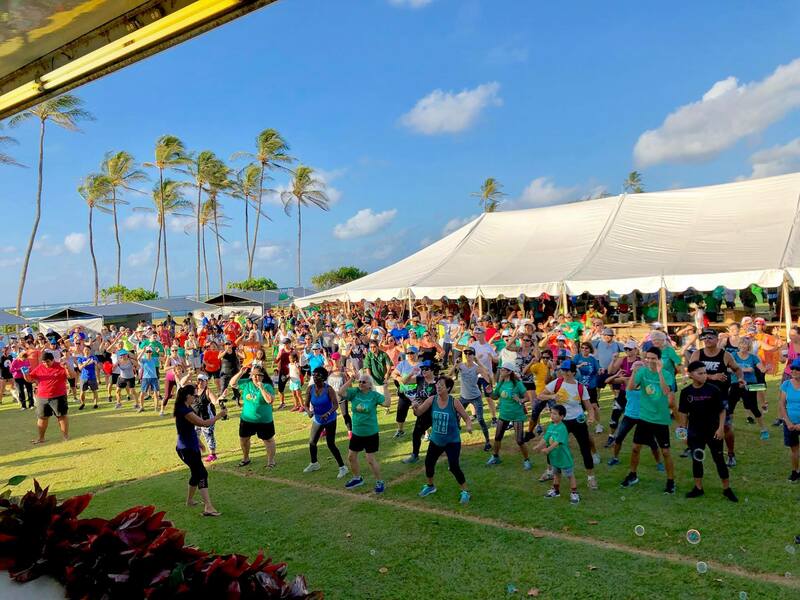 Whether they set that record remains to be determined, but there is no question the Mayor-a-thon set an unofficial record for most people on Kauai having a heckuva lot of fun while exercising. They ran. They walked. They biked. They danced. They waved their arms high. They jumped. They hula- hooped. Strollers and dogs were welcome, too. Add in free breakfast and T-shirts, and you’ve got a happy, physically fit bunch of people. It was enough to put a big smile on the mayor’s sweaty face, even after he finished biking nearly eight miles in heat and humidity, all while stopping along the way to join others doing Zumba, line dancing and talking story. It was an emotional day for Carvalho, this being his final time leading the Mayor-a-thon. He is being termed out of office after 10 years as Kauai’s mayor, and is running for lieutenant governor. He looked with delight on the crowd of keiki to kupuna milling around Kapaa Beach Park. “It’s all about being healthy, being fit, being well and enjoying each other’s company,” he said. He loves how the Mayor-a-thon has grown, from a few hundred and a few sponsors that first year to more than 1,000 this year and nearly 20 sponsors. And he loves the setting of the park, the path and the ocean. But best of all are the people. This group came from far and near. It wasn’t just Kauai residents, but from throughout Hawaii and the nation, with participants from New York, Arizona, Utah and Canada. Carvalho believes it could and should go beyond this island. The mayor proudly pointed to two electric buses on site, which also picked up participants and delivered them to the Mayor-a-thon. He got on one of those buses at 4:30 a.m.
“We’re moving in the direction of lean and green on Kauai and we’re setting an example for the state, I believe,” Carvalho said. Kauai triathlete Lisa Ledesma and others with Divas and Dudes ran nine miles Saturday morning, then pushed residents from Samuel Mahelona Memorial Hospital in wheelchairs along the path. “They loved it,” she said. Being part of the Mayor-a-thon “was just amazing,” Ledesma said. “It’s free, they bring people in by buses, good food, exercise, I see more people on the path than I see any other time,” she said. Ledesma added that watching excited keiki running, biking, walking and laughing was wonderful. “It doesn’t matter, they’re all out there, a new generation,” she said. Eric Lazar covered two miles on the path with a wheelchair. It felt great, he said. “It’s good to get some exercise in the morning, start your day off right,” he added. Has the Mayor-a-thon influenced this island’s level of health and fitness? “I think this community loves to be fit and healthy, and Kauai is a beautiful place to be out and about,” he said. Ching said the Mayor-a-thon has changed habits. “It got more people thinking they need to get out and exercise every day,” she said. “Any time you walk, it improves your health,” she said. Mary Lardizabal was among those swaying and swinging to the “Electric Slide.” She and 6-year-old Jaslyn Aquias were all smiles at they shuffled their feet and clapped their hands. “We just went with the flow,” said Lardizabal, who clearly had moves down. “I grew up with that dance back in the days,” she said, laughing. The Mayor-a-thon also included prizes. When the name of Carolyn Inouye was called for the grand prize of two nights at the Kauai Marriott Resort, there wasn’t a response at first. No one yelled or screamed, and for a moment, they were ready to draw a second name. She and friend Colleen Coyaso, who walked four miles that morning, were standing in the back and ready to leave, but Coyaso said they should stick around to the end. “I said, ‘No, I think you have to wait,’” she said. “She kind of held me back,” Inouye said. When Inouye realized it was her name called, she was speechless — and thankful. It capped a terrific morning. Carvalho said whether he’s mayor or not, he encourages everyone to get moving. “Preventive health, that’s my thing,” he said.